After some unforeseen setbacks, Robbie and I finally set out on our 2-day spontaneous road trip Friday morning. It's a funny thing - on our trips to Australia, France, Belgium, the Netherlands, Mexico, Jamaica, etc., I didn't take nearly as many pictures as I did on our short 36-hour adventure along the rural roads of northern Illinois. When you're visiting another country or a cool city, there is such an abundance of excitement and stimuli that you tend to miss a lot of the "little things." But when you don't have a plan, and you head out on an impromptu journey to wherever the hushed country trails take you, tiny details become so much more interesting. The often overlooked simplicities of whitewashed barns and budding trees and old water towers and decaying buildings are suddenly captivating. Life slows down and becomes undisturbed, and you're able to concentrate on (and appreciate) your environment, and just BE. It's really kind of magical. I have so much more to share about our little journey, but my sis Morgan has been visiting and I have to say goodbye (tear!) and get caught up on the mounds of work that have piled up since Thursday. I'll post most pictures and details in the next day or two, including where we went, what we did, and the little bits of awesomeness we discovered along the way. How was your weekend? 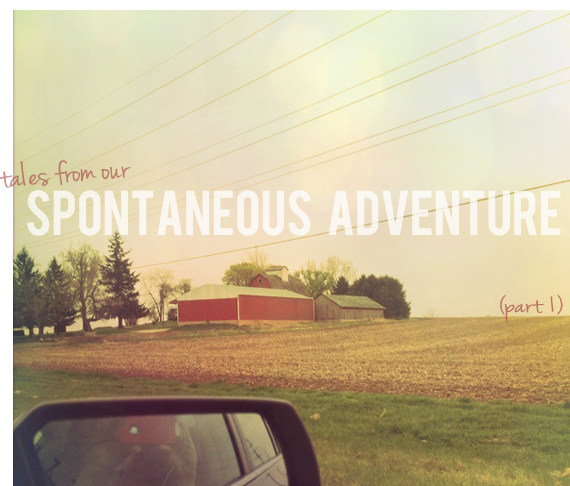 Did you have any adventures or moments of spontaneous goodness? Check out those fabulous new and returning sponsors for April, hanging out over there in the right sidebar! I absolutely adore all of their blogs and shops, and highly recommend taking a minute or two to click on their pretty graphics and pay them a visit. (If you're viewing this in a reader, just click here). oh i LOVE road trips.. but gotta say, i don't think hubby and i have ever just done a spontaneous trip.. we've always had something planned..
so now i have ideas for dates.. thanks dude! Can't wait to hear more about your trip. Love that bridge! What a fun idea! I always want to do things like this but, being the planner that I am, its rather difficult! Your pictures are beautiful-looks like such a quaint little town! Love it! Can't wait to hear and see more... you got some great photos! Just like everyone else, I am looking forward to more! Looks like lots of fun! I can't wait to see where you all went. I live in Northern IL, so maybe I'll find some new places to visit. ;) Here's hoping!